The story of an Italian immigrant in Portland who made his mark in cooking and teaching is told from his perspective and his daughter’s. Armando Polito sailed to the United States in 1920, when he was 10 years old, with his mother and siblings. His father, Giovanni Polito, had been in America for eight years, successfully running the Napoli restaurants in Maine. Shortly after Armando died in 2003, his daughter – Nancy Jo Polito – had trouble sleeping one night, and listened to some tape recordings he had made. The result is “Nobody Washes Me, I’m Italian,” a 270-page book telling a story similar to that of many Italian immigrants. 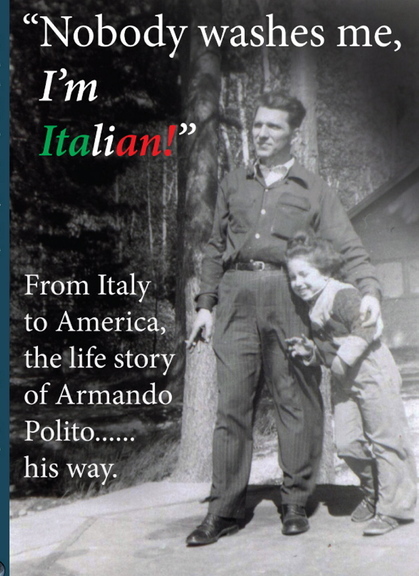 In the first 50 pages, Armando tells about his ancestors, his life in Bovino, Italy, the Napoli restaurants in Portland and Old Orchard Beach through the 1940s, and the creation of Luigi’s spaghetti and pizza sauce. For Armand (he dropped the “o” at some point) Polito, that was just the background. Nancy Jo Polito tells the rest of his story – decades teaching Romance languages at Deering High School, doing all of the cooking at home and raising a family. Q: Is your father’s story pretty typical of Italian immigrants around that period? A: Most definitely. They were a proud group of people who came through and worked really hard to assimilate. It hit me when he got sick at age 90 how different my life was, growing up with him. He was very self-sufficient. He told all about his life, about how a lot of Italians came at that same time, settling in Little Italy and Middle Street. I belong to the Italian Heritage Center, and there is a whole group of people there with the same background. He was a character, a no-nonsense person. He was like Desi Arnaz and was sometimes called Babalu, and my mother was Lucille Ball. He had us drilled over the years on food. We were never allowed to have ketchup on Tater Tots, with him cooking all of the food. Q: Did your father make the tapes about his life on his own, or did someone do it for him and ask questions? A: A couple of my cousins and I did this, asking him questions about his early life. This was when he was in his late 80s, and he also did some tapes for the Italian Heritage Center. When his father came over and started the Napoli restaurants, it was real hard on them because they were used to drinking wine all the time, and they couldn’t here because of Prohibition. Q: Is taping older people and maybe even writing a book like you have something you think most families should do? A: I tell people that all of the time, when I give talks, that people have to write down their splendid memories, just so they can pass them on. People have a legacy and they won’t talk about it unless you force them. Whether someone is a writer or not, they should at least put it in a little journal. Q: Toward the end of your father’s life he seemed to regret never going back to Bovino, Italy. Is that something you think immigrants should do? A: He never wanted to go back until he got sick. He had cancer for 20 years and never told anybody. He was busy all the time. He did all of the cooking and everything. When he went over there for music school (after graduating from high school in Portland), and the war started, he was lucky he got out of there. Mussolini was drafting everyone who was 18 or older, and he wasn’t even a U.S. citizen yet. Q: Do you still have the recipe for Luigi’s sauce? A: I make it every other week. They made it through the 1980s, when my uncle got sick and they did not have time to run the business anymore. I have the recipe, but it isn’t written down and I never give it out. I do give away a lot of the sauce. I’ve been producing a new product from a recipe my father cooked up, called Papa’s Juicy Noodles. I’m in the process of producing a website and have contacted Whole Foods. My father didn’t like ramen noodles because of all the chemicals, so he created this so the grandchildren wouldn’t eat ramen. It is really good and easy. I took the little man that my father created to put on the Luigi’s labels and am using it on these noodles. Q: Do you still meet students of your father had at Deering and is he remembered? A: I run into people who had him in high school, and to this day they say he was the best teacher they ever had. He had trouble with English all his life, but he taught the Romance languages and that worked out well. I took him up to Shaw’s Northgate and a guy came up and said, “Hello, Mr. Polito,” and asked if he remembered him, and he did. I asked him how he did it, and he said he only remembered the good students. Q: Your mother outlived your father. Is she still alive? A: Oh no. She lived to be 96, seven years after he died. She had a stroke at a young age, 65, and she had aphasia and couldn’t get all of the words right. My father could never understand that and had a hard time with it. I have just started another book, and this one is going to be more about my mother, about care giving and my life as a care giver. I started writing late in life, and when I sent my book off to my editor – he has written for Alfred Hitchcock – he asked me if I had written before, because it was quite good. He didn’t change much, just changing how some of the sentences began and things like that. I was afraid he would take away some of my father’s antics, but he didn’t do that at all.